Lint update. Reseach and planning. In my world, every great project starts in the library. This one was no different. I wanted two things from the library. One was a book that lists a basic wardrobe. The other was some sort of primer about dressing, how to avoid the five separate outfits, no mix-and-match problem that I’m having. I started my search by looking for a book I used to own. It’s by Kim France and is called The Lucky shopping manual: building and improving your wardrobe piece by piece. I searched for it because I knew I could use the subject headings to find other books like it. Sure enough, the subject heading called “clothing and dress” brought me to exactly what I need. 10 steps to fashion freedom: discover your personal style from the inside out. I’m making my way through both Ready to Wear and The Look. I’m a bit nervous because Ready to Wear wants me to go through my clothes and put back only the things I love and am currently wearing. I can envision two things that I love and am wearing. This may have to be amended to “like” and am wearing. On the shopping front, I received notice that my favorite consignment store, Here We Go Again, is having a sale on Valentine’s day. Matt has class on Valentine’s day, so I made plans to go there after work but before my class on that night. By then I will have read more of the primer books and have a better idea what I need. On Sunday, I will stop at what I call “the fancy Goodwill.” It’s right on my way home from church and it is a Goodwill that only has the better designers. I will look for pants while I am there, as I am in dire need of them. Posted on February 9, 2008 February 6, 2016 Categories All (-ish), To Occupy my TimeTags lint1 Comment on Lint update. Reseach and planning. A sophisticated Chicago art gallery owner visits her husband’s North Carolina family. Amy Adams steals every scene. A subtle and tender film. Charlie Wilson won the war and lost the peace. All three actors did a fabulous job and the writing was snappy. I’ve never been so happy to see surface-to-air missiles. What I’m doing for Lint. Yes, Lint. I observed to someone yesterday that I’m always pronouncing “Lent,” the liturgical season, as “lint,” the stuff found in your pocket after you do laundry. And since my religious tradition doesn’t really celebrate Lent, and I’m going to do something a bit different this year, I’ve decided to celebrate Lint. Last year I gave up eating out. This year, I’ve decided to do the more superficial, but very necessary, task of dealing with my wardrobe. I don’t like to shop. I didn’t like it anyway, but when my size expands, as it has now, to the very verge of “normal” clothing stores, I really hate to shop. I can never find pants that fit, which means I have one pair of nice pants and one pair of nice jeans to wear to work. The other three days I wear skirts. I’ve got some good skirts, but my tops haven’t been replenished for some time. Clothing used to come to me. My roommates gave it to me, or people would leave it on a donation table in my apartment complex. Now my Aunt gives me clothes, which is nice, but she is 30 years older than me, which means my wardrobe has slowly been creeping toward matronly for some time now. I also don’t like to spend money on clothes. I think they are too expensive. So I buy my stuff in thrift shops and consignmet shops. I like shopping there because I’m supporting a local business or charity and avoiding the whole “made in a sweatshop” guilt entirely. But thrift/consignment shopping means there isn’t as much choice so I have to go to more places. I absolutely HATE buying underwear. That I buy new. Thrift shop underwear is where I draw the line. The other day I figured out that I last bought underwear in 2004. It’s sort of holding up, but not well. I usually shop about twice a year, but it’s been awhile. I supposedly don’t have time. I was supposed to go shopping over Thanksgiving break, but I didn’t. I was also supposed to go shopping over Christmas break. That didn’t happen either. So for Lint this year, I will go shopping six times. Ideally once per week-ish. Three times during the week I will evaluate my wardrobe for what I need and what I need to get rid of. I’ll see what the library has for wardrobe books. I’ll update you on my progress. Things will happen. It will be a good Lint. Posted on February 7, 2008 February 6, 2016 Categories All (-ish), To Occupy my TimeTags lint1 Comment on What I’m doing for Lint. 15 January–Peter Ames Carlin. The excellent TV columnist in The Oregonian. 16 January–Jenna. My ex-roommate who does write letters. 17 January–Eugenie Olson. Author of Love in the time of taffeta. 18 January–Sara. Also writes letters. 21 January–Susan. Sporadic letter writing college friend. 22 January–Mary. Apparently she got married. I wrote for details. 23 January–Mom. Sent a word search I created so she could entertain herself while recovering from surgery. 24 January–Inara Verzemniks. Reporter for The Oregonian. I love her writing style and subjects. 25 January–Cindy. I’m not holding out hope for a letter back, but they do come sometimes. 26 January–The Oregonian. I was annoyed that they don’t tell us where missing features are. 27 January–Alison Bechdel. I loved this week’s comic, and I wrote to tell her so. 28 January–Teresa. I’ve sort of lost touch with her. Maybe this will revive. 29 January–Graham. Thank you note. 30 January–Matt. Some days dashing off a postcard to someone you live with counts as writing a letter. I mailed it. Posted on February 4, 2008 February 6, 2016 Categories All (-ish), To Occupy my TimeTags resolution1 Comment on Letters written in January. I usually make resolutions for the start of the new year. Some years I pick five or six things to work on. Last year I made none. This year I decided to go all out. I write a lot of letters. Letters to friends far away, letters to the editor of The Oregonian, letters to authors I read, angry letters to companies, my congressional representatives and people I am not liking at the moment. The only problem is that all of these letters get written in my head and none of them make it to paper, much less into an envelope, addressed, stamped and put in the mail. I used to write letters all the time. I had email the last two years of college and my friends and I would email back and forth, but we still wrote letters. In my mid 20’s the letters started tapering off, replaced with long emails that were printed out and saved as if they were letters. Then the emails tapered off, and what did come, got deleted with all the other email. I realized awhile ago that I hadn’t written an actual letter in years. There are so many steps to letter writing. There’s the letter being written, which assumes paper, pen and legible handwriting are present. Then there is the finding of an envelope, the correct address, a stamp and a mailbox. Somewhere along the line those steps became overwhelming and I stopped doing them. I have a few friends, two exactly, that still write letters. Jenna never really stopped, and I can remember when we were roommates, having a discussion about how people didn’t write back when she wrote. After I moved out, I became one of those people. My friend Sara sent me a letter last year that reminded me what fun letters are. Sara’s letters are always covered in stickers. They are written longhand and in fun colors of ink. They discuss what is going on in her life and asks about mine. I wrote her back. And she wrote me back. And then that letter sat on my desk waiting to be answered. For two months. So, this year, I pledged to write and mail one letter per day. My plan was to assemble a letter writing packet. It would have envelopes, paper, postcards, favorite pens, addresses and stamps. I did that. My fears and assembling the letter writing packet had me paralyzed for the first two weeks, and I didn’t get started until January 14. But now I have been writing a letter per day. Here’s what I have learned. Having the letter writing packet is key. Writing a letter can take as little as 10 minutes and when you have all your supplies in one place, it only takes a minute or so more to have it ready to go out the door to the mail box. There aren’t as many mail boxes as there once were. I read awhile back that the post office has been removing little-used ones. We have none around us that are on the way to anything, though we do have a branch post office in our neighborhood. Even though I’m not thrilled with my handwriting, I actually enjoy hand writing letters. For some reason, sitting in front of the computer typing a letter seems like work, while sitting at the table or on the couch or in the doctor’s office with a pen in hand is fun. I do feel awkward writing people I know who I’ve never written to. I worry that they will feel pressure to write me back and my letter will become a bundle of guilt sitting on their desks. While it would be nice for everyone to write me back, it’s not super necessary, nor do they have to write me via the post office. Email works too. I hate writing my return address. I get all clench-y when I am writing it, and find myself holding by breath. I just printed out return address labels this weekend. Writing can be cross marketing. I included this blog address on the return address label. I enjoy dashing off letters to authors and people who write for the paper or magazines. The internet actually helps with this. It is very easy to find a mailing address for any author you might want to write you. I will get letters back. Just yesterday, the author of a newspaper article I wrote to wrote me back. “Who the heck is this?” I wondered as I opened the mailbox. Then I was delighted to read his letter. Do you want to get a letter from me? I need your address. How do you know if I don’t have your address? You would know because you didn’t get a Christmas card from me. If you want me to write you, there are two options. If you have my address, write me. Or just email me your address and I will add you to my address list. My email is (disguised here, see if you can break the code:-): stenaros. shift 2. the free email provider that starts with a “y”. dot com. For blogging purposes I will publish a list now and then of who I have been writing too. Seven books read this month, with one of them being 800+ pages. It was a good reading month. I didn’t get a chance to publish these individually, so here is a long entry. Roger, early forties, alcoholic, works at Staples. Bethany, early twenties, goth girl, works at Staples. Bethany finds Roger’s writings one day, including a short piece Roger wrote about Bethany’s view of the world. They begin writing back and forth to each other and Roger shares his novel, Glove Pond with Bethany, who really loves it. I liked the relationship between the two characters, which was the rarely depicted between-sexes-friendship. I liked how badly written Glove Pond was. I liked that the story captured the numbness of working at a major chain store. I was confused about the ending. Overall, I enjoyed the book. What if your main character was an orphan (favorite tv plot device of the 1980s) and suffered from Tourette’s Syndrome? And what if he worked as a quasi-detective/driver for a small time mafia guy in Brooklyn? And what if that small time mafia guy got killed and the main character tried to solve the case? If you put all those things together, you get this book. I liked the writing style and how I gradually adjusted to Lional’s Tourettic outbursts. I liked that it was essentially a mystery, but not as formulaic and more interesting. I especially liked understanding how Tourette’s Syndrome manifested itself in this character, and it cleared up for me why all people with Tourette’s don’t just take medication, something I’ve often wondered. This was a nice escape-type read. I’ve been not eating gluten and sugar among other things anyway, so I figured I would check out to see what Dr. Gott says about the whole thing. Dr Gott thinks that you just need to eliminate all flour from your diet (so no bread, or pasta or tortillas, etc.) and all sugar and voila! No more excess weight. According to him, once you reach your goal weight, you can start eating bread products again, but not sugar. He does, however, think sugar substitutes are fine, something I find not fine. It was a pretty simple diet plan and it did inspire me to stop eating what were my calorie bombs of honey, coconut and peanut butter. If you aren’t too attached to flour and sugar anyway, this might be the book for you. I got this book because it sounded interesting. Not interesting like, “I want to read that,” but interesting like “I should read that.” When I got it, I groaned. It was huge, 834 pages, and I figured I would start it and wander off about a quarter of the way through. Boy howdy was I wrong. It was an incredibly engrossing book and I loved every minute of it. The six Mitford sisters, born between 1904 and 1920 started writing to each other in their 20’s and continued throughout their lives. Four of them became authors, one moved to Germany and fell in love with Hitler and his party, one married the leader of the pre-WWII fascist party in England, one moved to the United States and became a communist and one ended up the Duchess of Devonshire. It was fascinating reading their views of history as it happened. The 1930’s correspondence between Unity and Diana was particularly eye opening. I enjoyed this book so much and recommend it for anyone who likes history and reading other people’s letters. It was as if the author knew me when I lived in Boston. Aside from the strange sense of deja vu, I enjoyed this book, particularly the main character’s roommate and her “secret” career. Another good, light novel to read in a day. I picked this one up when I was near the end of Henry and Clara and things were getting ominous. This was set in a small Florida town and is peopled with a lot of quirky characters. Not overly quirky, so they are annoying, but just unique. Jesus comes to town at Christmas time in a fancy RV. His method of bringing salvation is a bit suspect and the people in the town deal with Jesus and their own problems. I’ve read this before and remember enjoying it and so I picked it up again. It’s the story, based on true events, of Henry Rathborn & Clara Harris, the engaged couple who were the other two people in Abraham Lincoln’s box. The book begins with John Wilks Booth making his escape from Ford’s Theater and then flashes back to Henry & Clara’s first meeting, when Clara was ten and Henry seven. Clara’s father married Henry’s mother three years later and the children were raised as step-siblings. The book follows their lives from that time, through the Civil War, the assassination and it’s aftermath, as well as their married life. Those looking for a happy ending won’t find it, but it is a well written book with an engrossing story. I didn’t read the whole thing, but I did pick up some good tips from this tome. Cooking from the Garden: Original and Unusual recipes to enhance your garden harvest. This doesn’t have very many recipes and most of them have too many ingredients for me. The Structure House Weight Loss Plan. I started this, but The Mitfords were distracting me and I never got through the first quiz. I couldn’t get into this book set in a magazine publishing office in the 1920s. I may have not given it the proper attention in the first 50 pages. Checked out and didn’t even read. I at least started everything I read this month. Posted on February 1, 2008 February 6, 2016 Categories All (-ish), BooksTags books1 Comment on Read in January. There was this holiday this month, you might have heard of it. It’s called Christmas? It cramped my reading style. I only read six books, but I was busy. I think I was sleeping better, too, which is nice, but means less reading time. Also, post Christmas I built shelves, and when I wasn’t doing that I was watching season one of The West Wing. So, not as much reading for me. I’m pretty happy with Goodreads, though. Not the least because I have a place to put a permanent “to read” list that I won’t use. Thanks for recommending it, Sara. And thanks for the recommendations, April. Keep them coming. The Year of Living Biblically. The story of General Dann & Mara’s daughter, Griot and the snow dog: a novel. I got the feeling things weren’t going to go well for the protagonist. I put down the book and didn’t every pick it up again. Men’s Health ultimate dumbbell guide: more than 21,000 moves designed to build muscle and increase strength. I’ve been flirting with the idea of starting a weight training program again and this was the perfect book. Imagine, doing a whole workout at home with just dumbbells. I’ll probably buy this book. I liked this book, it is very slender compared to many “save the earth” tomes. It’s a step-by-step book to reduce your carbon footprint. I’ll revisit this when I have more time. I was really into this book for about half of it. It is a very interesting “suppose if” book. Suppose if Erroll Flynn fathered a child with a 16 year old Jamaican girl. Then suppose that girl grows up during the independence movement. I loved the writing style and the twisty and turn-y details. I just didn’t finish it and back it went to the library. Someday. I hated this movie when it came out so I decided to see if the book was any better. I started reading and became very confused because I was in Mexico, not Montana. I eventually figured out that there were three short stories within the book. I started reading “Legends” on the day it was due as I was taking it to the library and it did seem good. Maybe I’ll get it again soon. Flipped through it and saw some weird font, things going on. Ran out of time and decided to send this back. Posted on January 2, 2008 February 6, 2016 Categories All (-ish), BooksTags books2 Comments on Read in December. New Luck for the New Year. 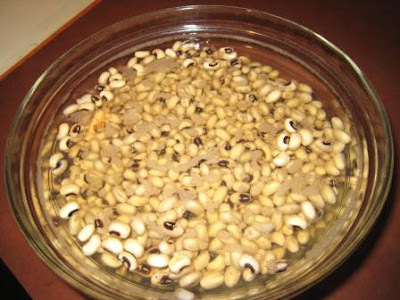 Did you eat your black-eyed peas and greens yet today? Better get them cooking. They bring good luck for the new year. This recipe is from “Still Life With Menu” by Mollie Katzen. It’s easy, but the original makes a ton, so I halved it. 1.5 c black-eyed peas, soaked for 8 hours or so. 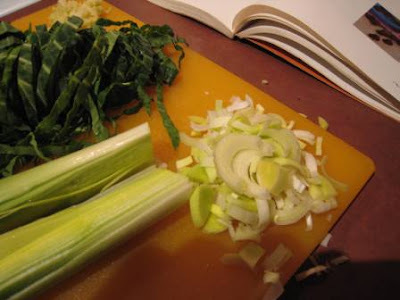 1 medium-sized leek, cleaned well and chopped. 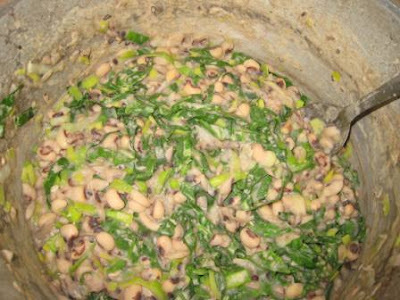 When the black-eyed peas are just about tender, stir in the salt, greens and leeks. Cover, and continue to simmer just a few more minutes. 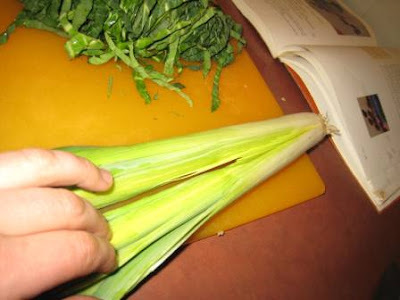 The greens and leeks will cook very quickly. Season to taste with freshly ground black pepper and serve hot. Mmmmm. Good luck and good food. Posted on January 2, 2008 January 28, 2016 Categories All (-ish), To Occupy my TimeTags cooking, food, recipe3 Comments on New Luck for the New Year. 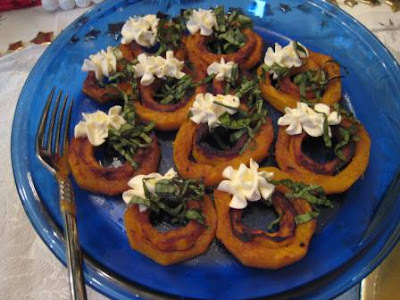 Tara told me a recipe for squash and goat cheese and basil. This was the result and looked great on the Christmas dinner table. It tasted good too. Now you can make your own! 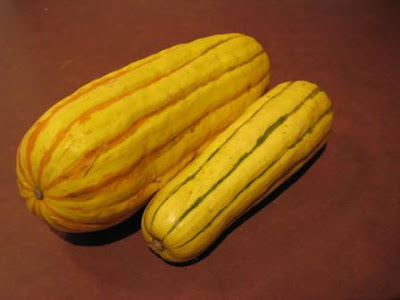 Behold, delicata squash. I happened to have a bigger one and a smaller one and they combined nicely to make thicker wreathes. Peel using the technique explained here. This picture gets the gist of it, though. 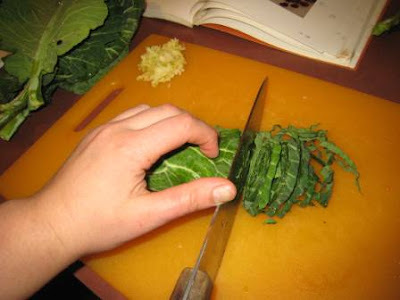 Slice into rounds and pull the gunk out of the center. I had an apple corer that worked great for the small size, but I used a small knife for the bigger rounds. I was supposed to use goat cheese, but Fred Meyer was out of it. 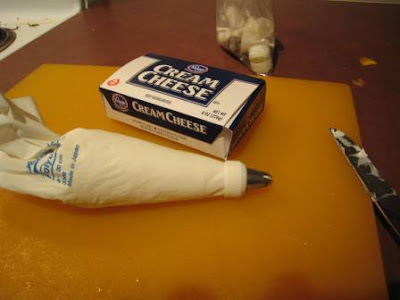 So I substituted cream cheese. I put mine in a pastry bag with a star tip to make those lovely stars, but you could just plop some in the center. 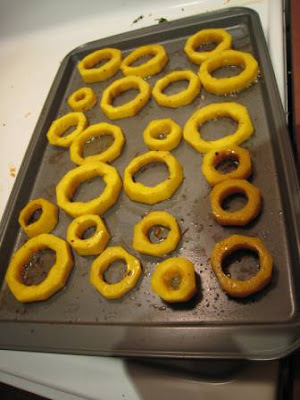 I let mine cool to room temperature, then stacked the smaller rings inside of the bigger ones. Then I took basil and chiffinad-ed it which I have no picture of, but this video nicely explains it. Use your star tip to make a few stars per wreath, sprinkle your basil over the top and enjoy. 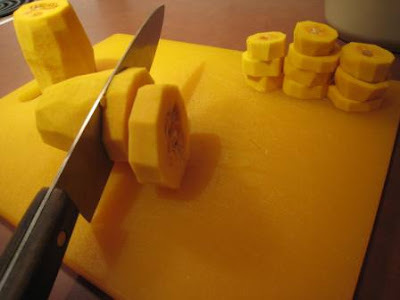 Note, if your squash is too hot, the cheese will melt and ruin your lovely star effect. 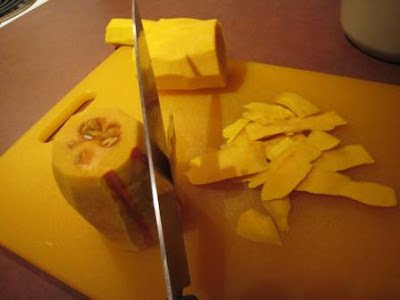 Next time I will get a butternut squash with a very long neck, peel it, cut the neck into slices and then quarters, then cook as above and top with goat cheese and basil. I think it will also be yummy.